Today I’m going to treat you to my top 5 most memorable ‘ghosting’ experiences of my life. In chronological order. My Father was the first man who ever ‘ghosted’ me and he only partially ‘ghosted’ me, in all fairness to him. As in, he would disappear for long periods of time and then re-appear as and when it was convenient for him (I suspect it was when he had money). Again, in all fairness to him, this was before the mobile phones and, since he didn’t have a permanent address per se and was in the habit of changing wives and girlfriends quite regularly (before, during and after he was married to and subsequently divorced from my mother), I couldn’t reach him anyway, so I couldn’t tell if his silence was intentional or simply due to scarcity of communication means. It must have been almost a year of not knowing anything about my Father, when there was a knock on the door. I opened to find my father’s ‘latest’ wife. She looked like she’d been crying. She asked me when was the last time I had spoken to my father. I said, I didn’t remember. He died two months ago, she said. As it turns out, once in a bloody blue moon, somebody does die. But remember, it’s the exception, not the rule. The second time I got ‘ghosted’, I was a poor student, in my early twenties, living in below-standard shared-accommodation at the University of Bucharest student dorm. He was thirty years old, tall, handsome, rich and Greek. He was a God. And for some unknown reason he fancied me. We had a sort of long-distance relationship for a few months during which he made me presents, took me out for dinner and called me every day. One day, he didn’t call and I couldn’t sleep the whole night, worried that something might have happened to him. Late in the afternoon the next day he called and he gave me some lame excuse (I forgot to call you, or something like that). But it didn’t matter to me because he was alive and well and everything was ok again. A few days later he ‘forgot to call me’ again. Only this time he never called again. I spent agonising months wondering why he did that. I can’t remember if I chased him or not. It was a very long time ago. But I remember I could’t hear anyone speaking Greek or seeing Greek motives or smelling Greek food without feeling tears forming in the corners of my eyes for a very long time. I’ve probably been ‘ghosted’ many times in between The Greek God and The Single Dad, but they mustn’t have been memorable, otherwise they would be on my top five list. Anyway, Single Dad and I met on LoveStruck. He had a little girl who lived with his mother and a demanding job in the City. We hit it off and had a few good dates, probably too many glasses of wine. He wasn’t particularly romantic and he had a deprecating sense of humour but seemed to like me enough. We went out for two months and spent the odd night during the week and the weekends together. One evening, we had agreed to meet but he stood me up. He left me waiting outside London Bridge station until I was too cold to wait and walked home. The next day he apologised, he said it was because of work. I forgave him. Again, I was just happy he was safe and sound. A few days later we went to the cinema. He was absent-minded and didn’t give me the attention and affection I craved. I picked a fight on the subject. I then felt bad about it and wanting to make amends for my behaviour, I called him a few days after that. He didn’t answer. He texted to say ‘Sorry I’m a work. Will call you later.’ He didn’t call me later. In fact he never called again. He kept cancelling dates at the last-minute. I told him how uncomfortable that made me feel. I told him about Single Dad and how much I hated being de-prioritised, especially because of ‘work’. He said he didn’t like it either, but what could he do if he had to work overtime? He blamed his boss, but I sensed an undercurrent of spite towards me, for reminding him of it. We had an awkward date.I texted him the next day. He replied. I texted him again. He didn’t reply. I texted him once more. And once more. I emailed him. He never replied. Like ever! I felt a lot of shame. I blamed myself for everything and especially for texting him when he had long stopped replying. It was like trying to squeeze water out of a rock. A futile exercise, but, irrationally, I couldn’t stop myself. Ok, I tell a lie. I wasn’t really ‘ghosted’ by my husband. I put him on the list because I needed a top five, and to be honest, I couldn’t recall five pure ‘ghosting’ situations (which is great for someone who was so terrified of ‘ghosting’, right? Just comes to show how serious emotional scars can be). 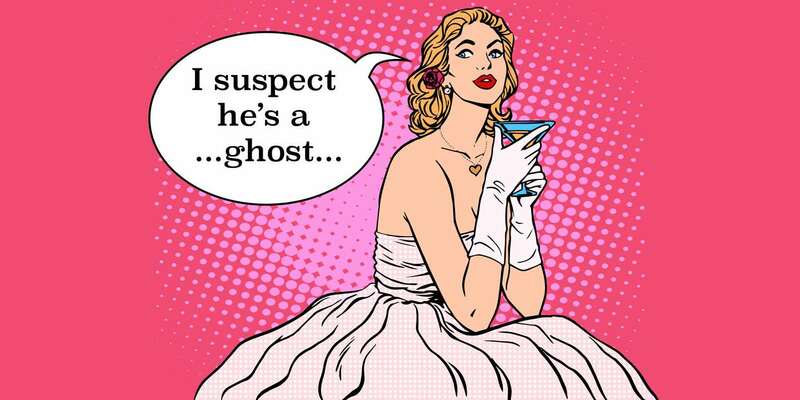 My husband, like my father, only partially ‘ghosted’ me. We had been dating for two months and had a whirlwind romance. During that time, I even took him to Romania to meet my mother. But after a romantic weekend trip to Vienna, he stopped texting. He replied when I texted, but he was no longer there. He probably would have disappeared into thin air if I hadn’t kept on poking him with texts, but thankfully I didn’t let that happen. After almost a month I wrote him an email and told him the truth. That I really liked him and I hoped he liked me too, the way I was, a bull in a china shop, but at least an honest one. He agreed to meet me after receiving that email and we rekindled our relationship. We’ve been together ever since and I’m looking forward to a life of adventure and growing old together. The point of my top five most memorable ‘ghosting’ experiences is this: it may feel like there is no closure after ‘ghosting’, but in reality there is. I knew deep down (and after many years, I know it for a fact) that my Father was a troubled man who was unfit to be a father (and he knew it!) and whom I was better off without; that Greek God only saw me a pleasant distraction; that Single Dad had a lot on his mind and that we weren’t that much into each other anyway; that an Actor in a Hurry probably had a lot on his mind too and didn’t liked to be reminded of the things he did wrong; and that my Husband just wasn’t sure I was The One for him until I convinced him otherwise. I for one, have not (to the best of my knowledge) ever ‘ghosted’ anybody. I’ve always responded to texts and most times I told people I didn’t want to continue the relationship. Most times I even gave them the reason. Because that is what I expected from others. How could one make amends if you don’t know what was wrong in the first place? It may be something so simple, so actionable (like I don’t know, bad breath or a high-pitched voice) that anyone can fix and move on from it. When people disappear without a trace, it’s mostly because they are ashamed. They can’t face you to tell you what is really wrong because it’s probably something that reflects on them. ‘I’ve only used you’ or ‘I wasn’t really that into you but I lead you on anyways because I have a weak ego’, or even ‘You’re too fat and I really like skinny women to make me feel good about myself‘ spring to mind. 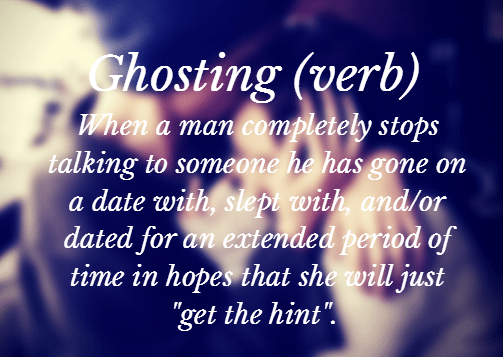 I know it’s hard to believe but ‘ghosting’ it is almost never about you. And even if it is, it is because of circumstances you can’t control at that time in your life. I couldn’t change the fact that I was my father’s daughter and that he was a very bad father. Or that I was a poor average-looking student from Romania with no prospects and not enough glamour to be the right kind of partner for my Greek friend. Or that I wanted a relationship with someone who was under financial pressure and fighting a custody battle. Or that I wanted a relationship with someone who was going through an existential crisis. Or that I wanted a relationship at all. If wanting a relationship is your biggest crime, then congratulate yourself for it. You are NOT the one with the problem. Get your FREE copy of The Love Project Workbook here. If you want to run your own Love Project, come join The Love Project group on Facebook.